Starry stonewort is a submerged aquatic macroalgae with many irregular branches. It is native to Europe and was likely introduced in ballast water to the Great Lakes. Fragments of starry stonewort can easily attach to the fur and feathers of mammals and birds, or attach to boats and fishing equipment allowing it to spread from one water body to another. Reports show that Starry stonewort was first found in 1983 at Lake St. Clair, along the St. Clair and Detroit Rivers. Now it occurs in lakes in all Lower Peninsula basins and in Millecoquins Lake of the Upper Peninsula. Michigan has the most reported occurrences of any State. 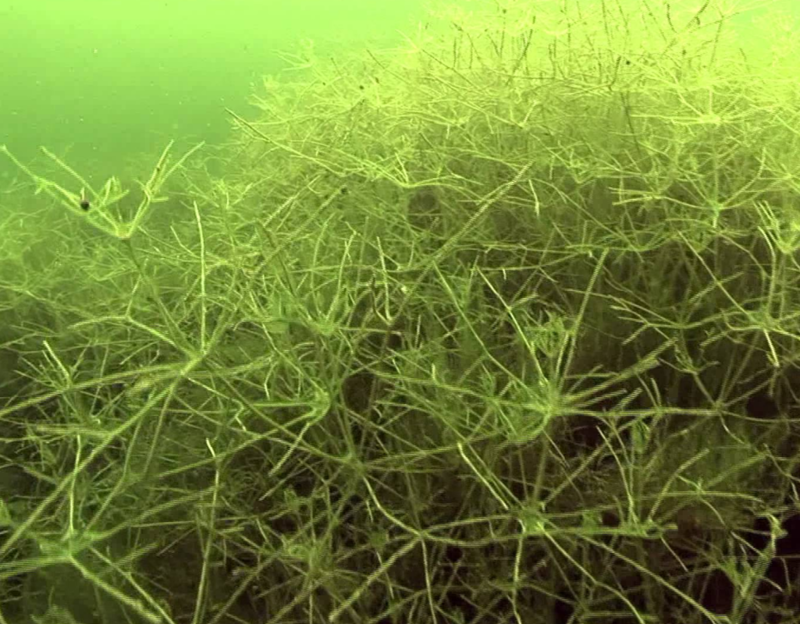 Starry stonewort forms a dense, vertically thick mat that completely covers the lake bottom. Starry stonewort forms dense mats in lakes and can significantly reduce the diversity of other aquatic plants. Dense mats of vegetation can also impede the movement of fish, spawning activity, water flow, and recreational activities. Starry stonewort is often confused with a native algae called muskgrass or Chara. Muskgrass is similar in appearance to starry stonewort, but is typically more bristly and has a bottom cover less than a foot tall. Muskgrass also lacks the small white stars of starry stonewort. 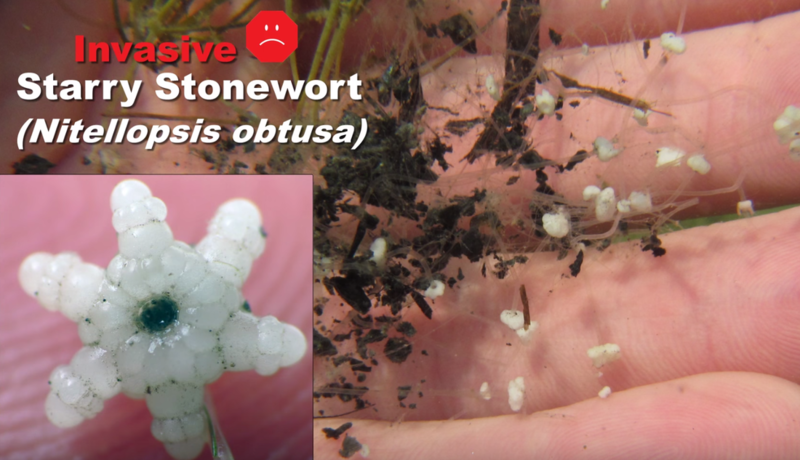 In this very helpful video, you will learn to identify starry stonewort (Nitellopsis obtusa) and distinguish it from several look-alike species. A production of the Wisconsin Lakes Partnership. Starry stonewort is often mistaken for other types of macroalgae like Chara. One test that may be used to distinguish Starry Stonewort from Chara is the “squeeze test.” In Starry Stonewort the protoplasm inside will pop out of the cell when squeezed. The remaining cell wall becomes a limp straw. In Chara, the protoplasm does not separate easily from the cell wall. 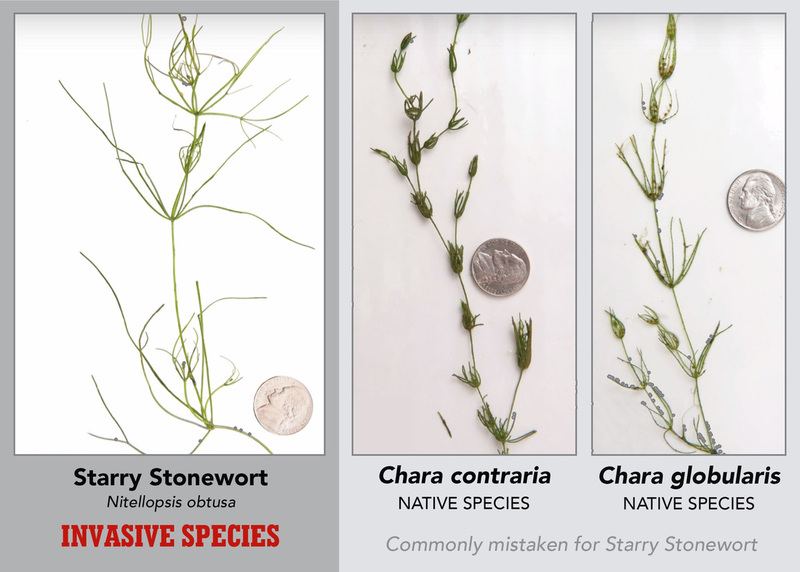 Learn to identify Starry stonewort. Drain lake or river water from live well and bilge before leaving access. Rinse boat and equipment with high-pressure hot water (104° F), especially if moored for more than a day, or dry everything for at least 5 days before launching in a new body of water. e- mailing info@watershedcouncil.org . Please note the exact location in which you saw the species.